Kori Simi language-center in Cochabamba, the heart of Bolivia and South America. Kori Simi comes from the Quechua language and means “golden tongue” or “golden language”. Obviously nowadays it is as valuable as gold to learn a new language and to get to know a new culture. That’s why our courses not only aim at the mastery of the language but first of all at communication in practice and the knowledge of Bolivian culture. All our teachers are native speakers with a lot of experience in the teaching of foreign languages. Most of our teachers also speak English and/or German. It is very important for us to offer our teachers a good working atmosphere, constant further training in modern didactics and a fair remuneration. The ICBA (Bolivian-German Culture Institute) is lodged in the same building as the KORI SIMI Center so that it will be easy for our Spanish students to get in contact with young Bolivian people who learn German. 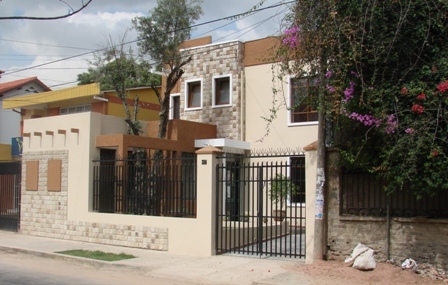 The Kori Simi is on a quiet side street, but close to the city-center of Cochabamba and easy and fast to reach with public transport.